Glass doesn’t smell like much and he’s not impressed by the color, but your dog is welcome in the store at Avalon Glassworks. We are located just off the Alki Trail, a scenic waterfront recreational path your dog WILL love. So walk him on in while you enjoy the neighborhood. Kids love to watch the process. 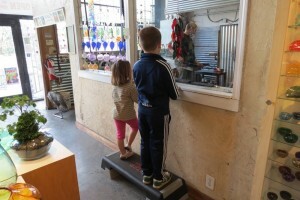 Younger ones can use the step to see over the wall into the hot shop. They are encouraged to ask questions of the artists. And, yes, they are certainly allowed to touch the art glass in the store. 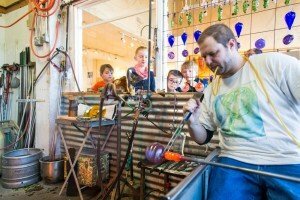 Check our glassblowing schedule for the best times to watch live glassblowing. Our retail store is open every day for shopping and enjoying.